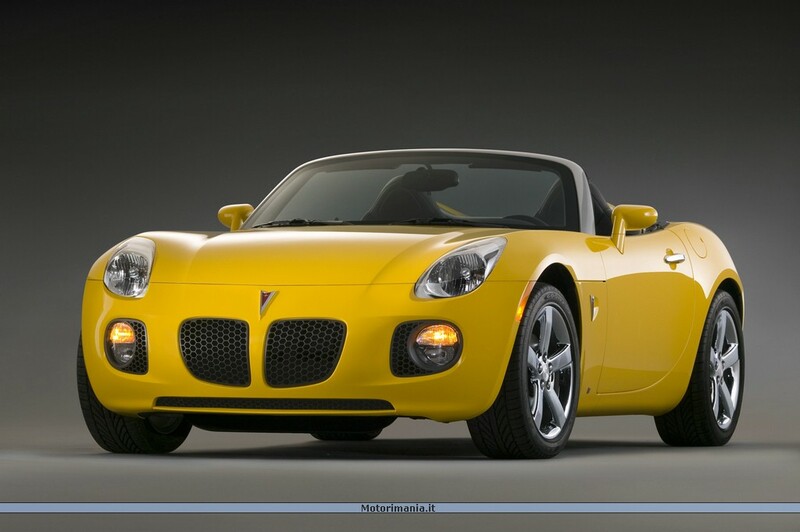 Pontiac Solstice, the sleek and seductive roadster, turns up the power and performance for 2007 with the addition of the turbocharged GXP model. The Solstice GXP produces 260 horsepower (194 kW) and 260 lb.-ft. of torque (353 Nm)** - a 47-percent increase over the base model - making its engine the most powerful production version in the Ecotec family. The Solstice and Solstice GXP are true sports cars with a near 50/50 weight distribution for balanced handling and feel. The models feature rear-wheel drive, four-wheel independent SLA suspensions and 18-inch aluminum alloy wheels. Drivers have a choice between a standard Aisin five-speed close-ratio manual transmission and an optional five-speed automatic. The '07 models continue to be well-equipped with a variety of comfort and convenience items appreciated by enthusiastic drivers. Standard equipment includes two-way power driver seat height adjuster, racing-inspired sport bucket seats with convenient seat cushion and seatback storage, leather-wrapped manual shift knob, AM/FM and CD stereo with six speakers, rear window defogger, rake-adjustable steering wheel, dual-stage frontal air bags and easy-to-operate cloth convertible top with glass backlight. Other options and accessories include sport metallic pedals, rear spoiler, Latte-color cloth convertible top, air conditioning, carpeted floor mats, MP3-capable CD player radio, MP3-capable radio with six-disc in-dash CD player, Monsoon Premium seven-speaker system, OnStar and XM Satellite Radio. With a wide variety of programming, XM has something to excite any driver. Whether you want to be entertained or informed, to laugh, think or sing, XM has the perfect channel for you - coast-to-coast, and in digital-quality sound. Solstice is available in seven bold exterior colors, each inspired by a personality trait: Aggressive (red), Cool (silver), Deep (blue), Envious (green), Mysterious (black), Pure (white) and Sly (gray). 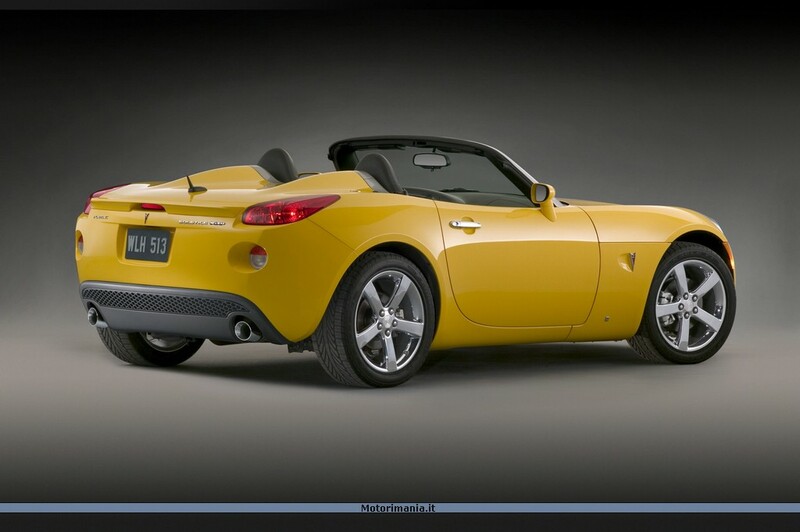 A new premium exterior color, Mean (yellow), is also available at extra cost. For 2007, OnStar-equipped Solstice models will feature a new service called OnStar Turn-by-Turn Navigation, the first factory-installed, fully integrated GPS navigation system from OnStar. Turn-by-Turn allows consumers to talk to a live advisor, who in turn sends complete step-by-step directions to customers' vehicles through their OnStar system. These audio directions automatically play through the vehicle's stereo as needed, triggered by the OnStar system's GPS capabilities. This enables drivers to be led to their destination while keeping their hands on the wheel and eyes on the road. OnStar-equipped Solstice models feature dual-mode (analog-digital) equipment. OnStar's digital equipment includes enhanced hands-free voice recognition capabilities including more intuitive continuous digit dialing and improved voice recognition accuracy. The OnStar service also includes the General Motors Advanced Automatic Crash Notification (AACN) system, making crash data available to the participating 911 centers to help them dispatch the appropriate life-saving personnel and equipment to crash scenes faster. With the 2.0-liter Turbo engine tucked neatly inside the stunning, curvaceous body of the Solstice, power and beauty become one in the GXP. The GXP is also outfitted with high-polished stainless steel dual exhaust outlets, and front and rear fascia extensions. Inside, the standard cloth or available leather seats are embroidered with a choice of grey or red accent stitching. Other standard interior appointments include brushed aluminum sill plates and embroidered floor mats. Solstice's superior handling characteristics have been enhanced for '07 with the addition of StabiliTrak electronic stability control system. StabiliTrak, standard on the GXP, helps drivers maintain control during sudden maneuvers or in low traction conditions by using a comprehensive series of sensors to measure acceleration, deceleration, steering angle and yaw rate. By monitoring these inputs, the system automatically controls the vehicle to help maintain the driver's intended path when a measurable deviation from the intended course is detected. It maintains control by regulating the vehicle's acceleration or applying brakes at any wheel. The Solstice's four-wheel disc brakes consist of 11.7-inch (297 mm) ventilated front rotors and 10.9-inch (277 mm) rear rotors, which combine to provide assured braking capability. ABS (with dynamic rear proportioning) is available. The Ecotec 2.0-liter Turbo engine that powers the GXP is GM's first direct injection offering in North America . Gasoline direction injection technology helps the engine produce more power without sacrificing the fuel economy of a small displacement port-injected engine. The Turbo 2.0-liter produces 260 horsepower* (194 kW) at 5300 rpm and 260 lb.-ft. (353 Nm) at 5300 rpm*. A 3.91:1 axle ratio is standard on the base level Solstice with the five-speed manual powertrain. The GXP model with the manual transmission comes with a 3.73:1 axle ratio. *Horsepower and torque are SAE certified. A new voluntary power and torque certification procedure developed by the SAE Engine Test Code committee was approved March 31, 2005 . This procedure (J2723) ensures fair, accurate ratings for horsepower and torque by allowing manufacturers to certify their engines through third-party witness testing. GM was the first auto manufacturer to begin using the procedure and expects to use it for all newly rated engines in the future. *Horsepower and torque are SAE certified. A new voluntary power and torque certification procedure developed by the SAE Engine Test Code committee was approved March 31, 2005. This procedure (J2723) ensures fair, accurate ratings for horsepower and torque by allowing manufacturers to certify their engines through third-party witness testing. GM was the first auto manufacturer to begin using the procedure and expects to use it for all newly rated engines in the future. **Horsepower and torque pending SAE certification.